The intricacies of the opposition had changed for Sunday’s race, with a repaired Ferrari for Niarchos and Mullen making things even more difficult at the front. 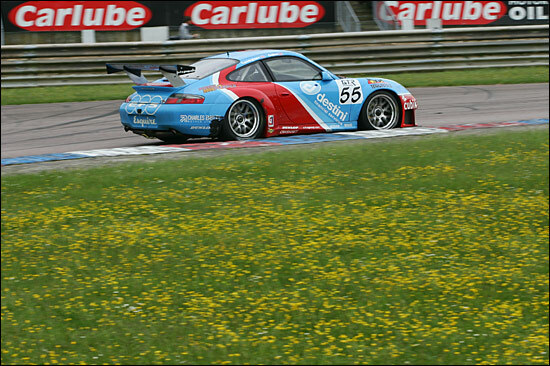 Behind though, the #77 Eurotech Porsche’s engine had been replaced and the replacement was, as Mike Jordan admitted, not as well developed as his usual version. In dry and bright conditions, the safety car was long gone into the pits as the two Ferraris slowed the pack to a crawl - before exploding across the line and heading the ranks down into the complex. “It was a pretty boring start,” for Ben Collins “everyone stayed put and I was boxed in on all sides. I was trying to have a look but everyone was too close and I couldn’t go anywhere without taking a big risk, so I just queued up and waited for something to happen. Finally, braking into the right at the Complex, Hughes went wide on the left and I went alongside, but he rejoined and our rear wheels hit.” It was dismal luck once again for Embassy, the impact leading to a puncture, and as Ben Collins crawled the Porsche back to the pits, this time they lost a lap to the flying Ferraris. Hughes had to pit too and the only solace Embassy could take is that their stop was quicker than LNT’s, so Collins was not quite last. Once again, the pace of the Embassy Porsche was at odds with its position - 24th - with only the Ferraris posting quicker laps. Collins moved into the top 20 after 11 laps, or 13 minutes, and put yesterday’s experience of carving through the field to immediate use. 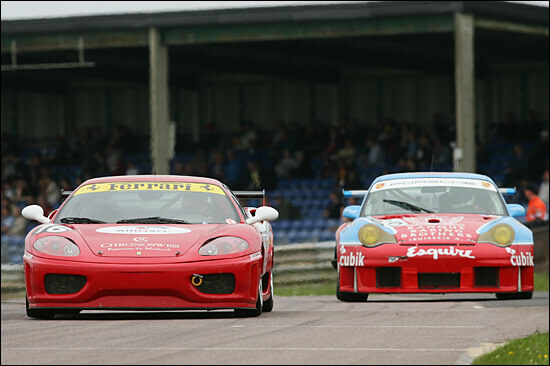 A puncture for Tech 9 promoted him to 19th but it was GT2 position that mattered and the next of those was, once again, Steve Hyde in the Eclipse Mosler. Hyde was 35 seconds ahead but lapping at a much better rate than he had managed yesterday. The chances of making it into the points today weren’t looking too encouraging. Those chances diminished further when Collins “couldn’t down-change at all. It was stuck in fifth to start with, but I thought I’d see if I could take it to sixth and then change back down, but it just got stuck in sixth then. Regardless of anything in the first lap, that was our overriding problem, otherwise we could have mounted a rear-guard action just like yesterday.” Another pitstop meant Embassy lost another two laps to the leaders, but the gear problem was at least fixed. Double attrition was now desperately needed for points and came in the form of a terminal incident between Godfrey Jones and his GT3 team-‘mate’ and then a retirement for a brake fluid-less #43 TVR, which trailed into the pits with 25 minutes gone. At the half-way mark, Embassy were on for a point for eighth in GT2 and all they could do was continue to pound round, hoping for bad luck to pick on another team for a change. 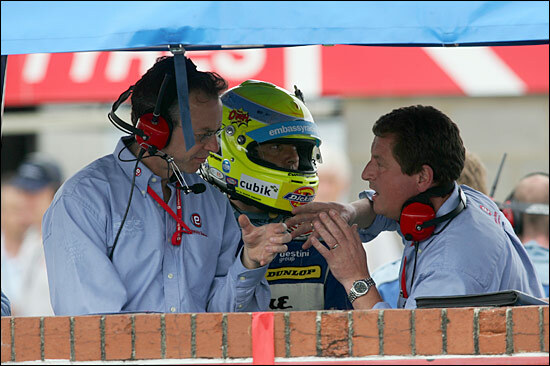 Neil is seen just before hios stint, below, with Geoff Kingston and Doug Bebb. ......Marco Attard on the next and Martin Rich on the penultimate lap, to bring the car home in 13th place overall, eighth in class. 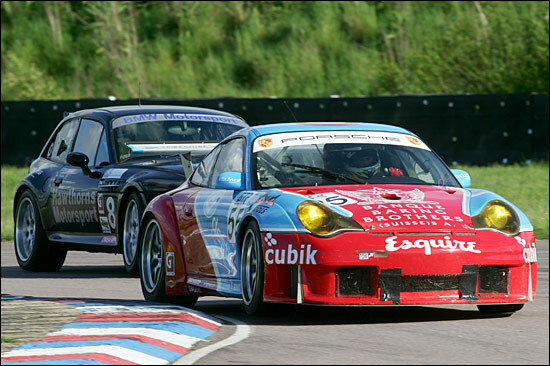 We will pick up Embassy Racing’s story at Castle Combe in a month’s time.